WHY DIDN'T THEY TELL ME ? Valuable information & practical advice, written with humor, by Mr. Moss, based on his own experiences. 50 pg. paperback, published by Luminaud inc. Covers a wide range of material on adjustment and rehabilitation, speech methods and exercises, support groups and more. Also includes ads which are valuable reference to many useful products. Has been a major and trusted reference for speech pathologists for mandy years. A workbook you can provide to the patient. 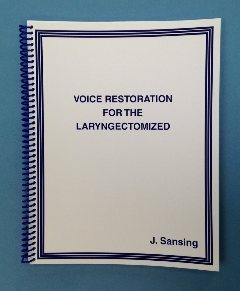 Taken from "Voice Restoration for the Laryngecomized" , includes suggestions for the use and text and word lists presented in the last chapter and Appendix 1. Helps people using esphageal speech and useful for people practicing with an artificial larynx or TEP speech. Single sided pages allows for plenty of notes and practice assignments on the apposing page. 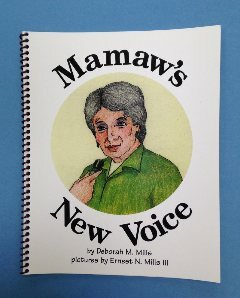 21 pages, soft covered, spiral bound, published by Luminaud inc.
Young Ashley finds out about a grandparent's surgery and "new voice" in these charming books designed to help families understand the changes brought about by the laryngectomy of a family member or friend. Written and illustrated by a laryngectomee and his wife for their own grandchildren, the story is told from a child's point of view, in easy-to-understand language that makes the book entertaining as well as informative. The illustrations are in a child-oriented, colored-crayon style. 34 pg. ea., soft cover, spiral-bound, published by Lauder Enterprises. 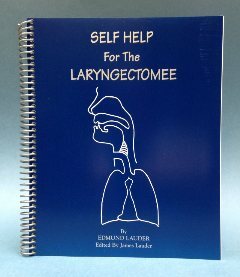 Offers a wealth of information, practical advice, helpful suggestions and useful tips for anyone working with new laryngectomees. 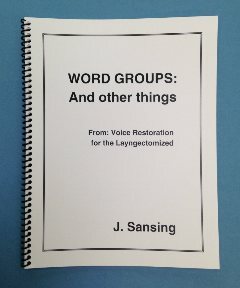 Contains word lists and glossary as well as contacts for laryngectomee support organizations and resource information. Jim Sansing's outstanding friendly and enjoyable presentation is taken from his own experiences on both sides (as a laryngectomee and as teacher of esophageal speech). This second edition includes the very useful color drawings by InHealth of the throat anatomy pre and post op. An ideal source book for student speech pathologists and those working with laryngectomees. 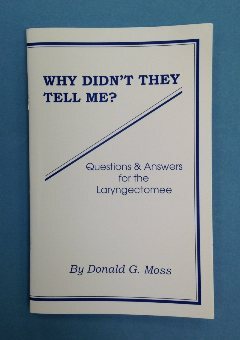 Also good for laryngectomees who speak well and would like to teach others. 108 pages, soft cover, spiral bound, 8 ½" x 11", published by Luminaud inc.